Sports are both an important window into culture and society and an increasingly dynamic site of media production, content creation and audience consumption. Through all of USC Annenberg’s sports-related courses as well as the two minors in Sports Media Industries and Sports Media Studies, students delve into the complex social issues concerning sports and social change, produce compelling sports media content, learn about the broader socio-economic and political context within which sports take place, and study public relations and brand management strategies for promoting athletes and teams. These popular courses and degree programs are taught by internationally-renowned faculty, including both leading academic scholars and outstanding professors of professional practice. USC Annenberg’s position at an NCAA Division I institution with world-class on-campus sports facilities and its location in Los Angeles, one of the world’s major global cities, provide a perfect laboratory for understanding, researching and exploring the economic, political and social significance of sports. Southern California itself is home to over ten women’s and men’s professional sport franchises, an international hub for broadcasting and the entertainment industries, as well as the site for many of the agencies who represent players and teams. In addition, Los Angeles will host the 2028 Summer Olympic Games and Wallis Annenberg Hall will serve as the main media center for the world’s press. Expose yourself to a range of professional settings, activities, and challenges related to the growth of sports media. Navigate the vast array of mediated content in one of the most popular forms of live and participatory entertainment. Assess the challenges for journalistic norms and storytelling techniques and new opportunities for the business of sports media management. Learn to cover sports utilizing diverse platforms. Understand the historical, social, cultural, ethical, and political roles sport plays in society and global culture. Decode the meanings sport takes on in a variety of mediated communication considering the production, consumption, and distribution of content in film, television, streaming services, online and social media. Assess sport’s value as a vehicle for social change and a site to explore the construction of identity, including gender, race and sexual orientation. Situate sport as a fundamental feature of entertainment and news media in relation to events, the construction of celebrity and the prevalence of sports fandom. 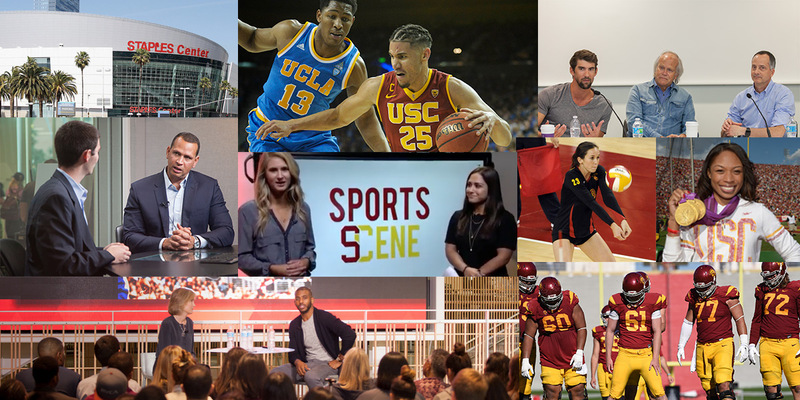 USC Annenberg offers more than 15 sports-related courses across the communication, journalism and public relations fields. Courses are taught by top faculty scholars as well as sports media professionals who work in the industry and teach at the same time. Our faculty are continually working to develop new courses on emerging topics. History and evolution of sports media industry; traditional, new and alternative sports media; globalization of sports; sports promotions and personalities. An inside look at the symbiotic relationship of sports and the media — from the interdependence of sports and media, to the coverage of sports in newspapers, magazines, radio and television. The economic and ethical issues involved, the conflicts of interest, the history and current status of sports coverage in American media today. Techniques of reporting and writing sports columns and commentary for print, video, radio and Web-based media. News and feature coverage of sporting events, including social and economic factors influencing sports in America. Critical examination of different styles of sports writing. Focus on the social context of sports writing and the relationship between sports and politics. Learn how to cover action sports with cutting-edge technology. In-class lectures and industry guest speakers focus on topics such as gender, race and history. Examine and analyze the ever-changing technology sector of the sports business and sports media world. Identify emerging technologies being developed in the sports industry and how they are being utilized to enhance the fan experience. Analysis of the images of the athlete and sports media helps us understand how sports dramatically affects such social issues as race, class and gender. Beat reporting with a deep dive into research, source development, and writing/reporting skills. Focus on current trends, history, major actors and key issues. Seminar in how to report and write sports: news, previews, profiles, features, columns. Sports Public Relations isn't only getting press for a team or player; it's managing communications among influencers. Complements overview course giving students advanced look at practitioners' role with professional athletes. Introduction to the field of sports information and promotion, including lectures, media assignments, role-playing, and presentations by sports professionals. Through our student-run media organization, Annenberg Media, students produce compelling and informative stories that include regular sports coverage. Students can work with Annenberg Media and other student-run programs in USC Annenberg’s state-of-the-art Media Center. Sports SCene, for example, focuses on USC sports. Learn more here. USC Annenberg’s Institute of Sports, Media and Society promotes academic programs, international research initiatives and professional engagement in the competitive world of sports and media. Clinical Professor of Communication Daniel Durbin founded and directs the institute, which hosts two sports and social change programs each year. These events bring together scholars as well as professionals from the world of sports and sports management to discuss important issues around sports and culture. The institute also houses the world’s only oral history project of African-American Major League Baseball players who played in the 25 years after MLB’s color barrier was broken. There is no better place to study sports than USC Annenberg. Our students learn from top scholars and seasoned professionals in the classroom, from firsthand experience with our student-run media platforms and state-of-the-art media center, and from their internships with organizations like ESPN or the L.A. Kings.